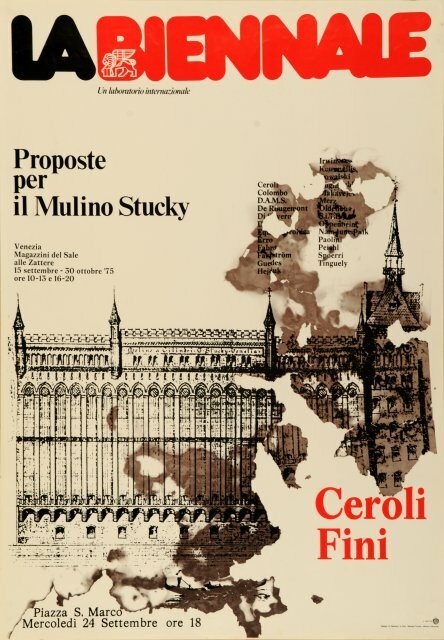 In 1975, during the presidency of Carlo Ripa di Meana, the first initiative towards an architecture exhibition was taken with the exhibition, “A proposito del Mulino Stucky” curated by Vittorio Gregotti. In 1980, the Architecture department was established during the four-year presidency of Giuseppe Galasso (1979-1982), who appointed Paolo Portoghesi as Director. Famous architects and scholars have been alternating in the direction of the International Exhibition over the years, such as Francesco Dal Co, Richard Burdett, David Chipperfield, Rem Koolhaas and Alejandro Aravena, who have led the Biennale Architettura to be one of the most prestigious architecture exhibitions in the world, a benchmark for both experts and architecture lovers. This edition focused on the issues of space, the quality of space, open and free space. Curators Yvonne Farrell and Shelley McNamara used a short text of their own, the FREESPACE Manifesto from June 2017, as the keynote of the Exhibition. FREESPACE developed from the Central Pavilion (Giardini) to the Arsenale, and included 71 participants. These were joined by two Special Sections: the first, Close Encounter, meetings with remarkable projects (16 participants) presented works that originated in a reflection on well-known buildings of the past; the second, The Practice of Teaching (13 participants) collected projects developed as part of teaching experiences. The Exhibition also included 63 National Participations (6 countries participated for the first time), 2 Special Projects, 12 Collateral Events, and a series of Meetings on Architecture. FREESPACE attracted over 275,000 visitors, on top of the 14,434 attendants of the pre-opening. Visitors under 26 years of age were 50% of the total. The 15th Exhibition lasted 6 months and closed with an attendance of 260,000 visitors (exact figure: 259,725) on top of the 14,180 visitors of the preview days. These figures marked an increase of 14% and 16% respectively when compared to the 228,000 visitors and 12,214 preview attendants in 2014. The visitors under 26 years of age were 45% of the total. The students who visited the Exhibition as a group amounted to 26% of the total number of visitors. 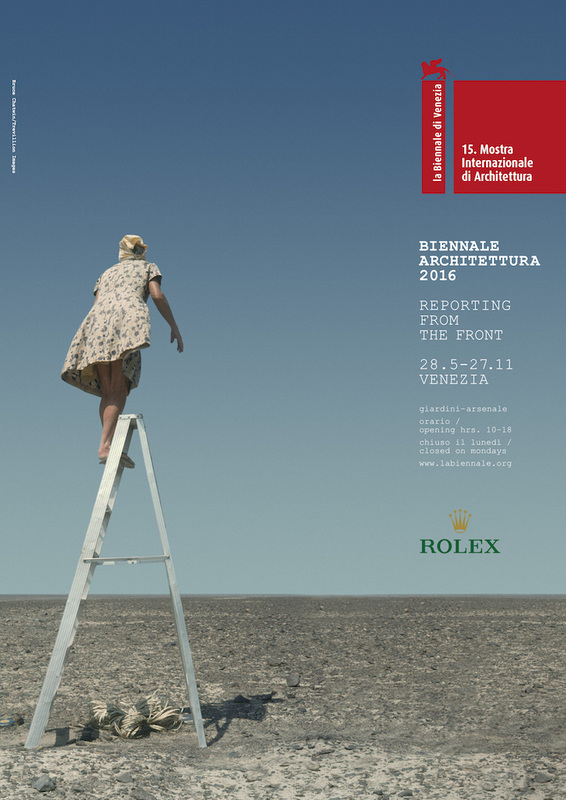 The main section of the Exhibition Reporting from the Front was laid out in a unitary sequence from the Central Pavilion (Giardini) to the Arsenale, and included 88 participants from 37 different countries; 50 of them were participating for the first time, and 33 architects were under the age of 40. The Exhibition also featured 65 National Participations and 20 Collateral Events, alongside 3 Special Projects, 6 Meetings on Architecture held at the Teatro alle Tese, and the international conference Urban Age. The exhibition was the result of research carried under the guidance of the curator, who reserved a specific topic for the contribution of pavilions (Absorbing Modernity 1914-2014), whose number rose to 66. Koolhaas also featured the fundamentals of our buildings, used by any architect, anywhere, anytime: the floor, the wall, the ceiling, the roof, the door, the window, the façade, etc. (Elements of Architecture). Furthermore, in the Monditalia section some aspects of the reality of Italy were represented by ad hoc research. Debates, meetings and talks enriched this Architecture Biennale, that had a duration of six months due to the intensity and the scope of the project. The show attracted 228,000 visitors in addition to the 12,214 visitors who attended the preview. The young and students represented 45% of overall visitors. Students who visited the exhibition in groups represented 20% of the public attending. 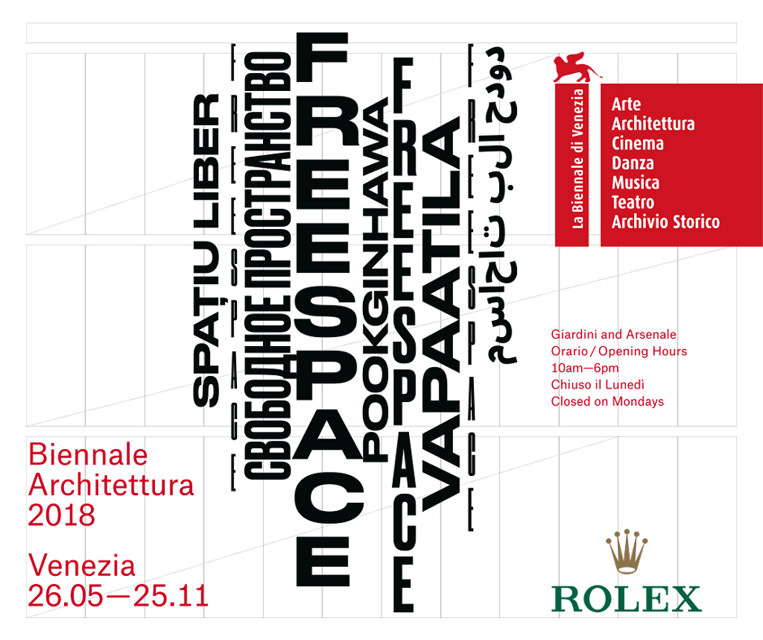 The 13th Architecture Exhibition has arisen and developed from the path of research that la Biennale di Venezia carries out in the field of architecture, which in turn has made la Biennale a major event over the years. Evidence of this is the new record number of more than 178,000 visitors for this edition. Designed by British architect David Chipperfield, the Exhibition spread over 10,000 square meters in a path from the Central Pavilion at the Giardini to the Arsenale. 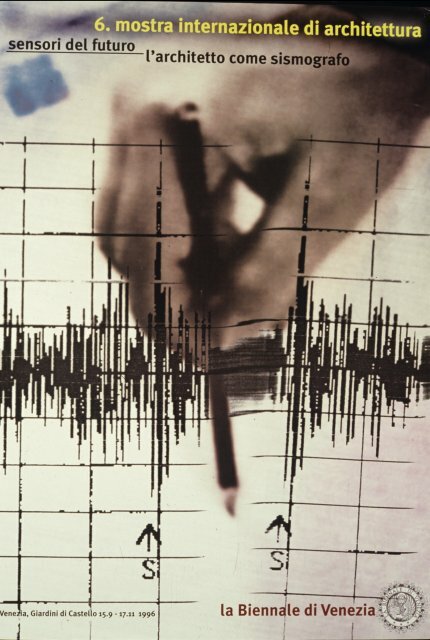 It comprised 69 projects made by architects, photographers, artists, critics and scholars. Many responded to the invitation of the Director with original proposals and installations expressly created for this Biennale, involving other colleagues with whom they share a Common Ground in their projects. A total of 119 participants took part in this Architecture Biennale. 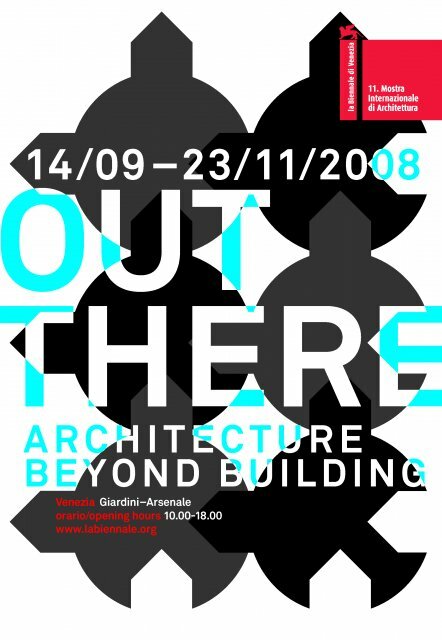 The 12th Exhibition intended to be a chance to experience the manifold possibilities of architecture, as well as to account for its plurality of approaches. 44 participants between architects, studios, artists, engineers from all over the world exhibited their works. There was an independent space for each participant, in order to make them show their understanding of the theme and their personal response to it. Individuals showed their position towards the interaction of new social and natural environments; all of which means that each person was his or her own curator. This way the atmosphere of the exhibition itself was achieved through multiple points of view rather than a single orientation. The Exhibition attracted 170,801 visitors in three months of opening. «This exhibition gave me the chance to open architecture to new points of view on the modalities of relation between people - said Kazuyo Sejima -. 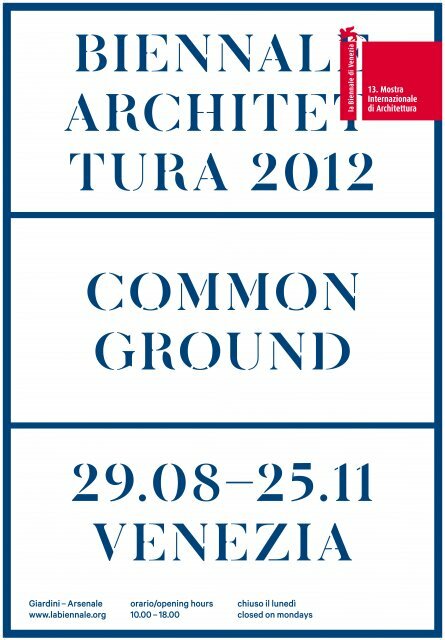 The process of construction of this Biennale was also a practical translation of the chosen title, People meet in architecture». According to Director Aaron Betsky – who had already directed the Netherlands Architecture Institute (NAI) in Rotterdam for six years – the 11th Exhibition, titled Out There: Architecture Beyond Building, “wants to move towards a building-free architecture, in order to face society’s crucial themes; it shows site-specific installations, visions and experiments that help us understand and value our modern world, feeling at ease in it, instead of presenting the graves of architecture, that is the buildings”. In Betsky’s opinion, “architecture is not about making things”. Buildings are just objects, and the action of constructing only generates built-objects; architecture has nothing to do with this. It has more to do with thinking and arguing about buildings. It is the way they are designed that matters. In more concrete terms, architecture is “what makes us feel at home in the world”. “The challenge if the eleventh exhibition -Betsky stated- is to collect and encourage experimentation, not by presenting existing buildings, but through seductive images”. The Corderie presented Installations, a set up of big scale and site specific installations, which all questioned how we can feel at home in the world. The participants were: Diller Scofidio+Renfro, UNStudio, Massimiliano Fuksas, Nigel Coates, Work Architecture, Droog Design, Philippe Rahm, M-A-D, Coop Himmelb(l)au, Vicente Guallart, Zaha Hadid, An Te Liu, Greg Lynn, MVRDV, Penezic and Rogina, Asymptote, Atelier Bow Wow, Barkow Leibinger Architects. To frame this theme, a “heavenly garden” by Kathryn Gustafson was realized. 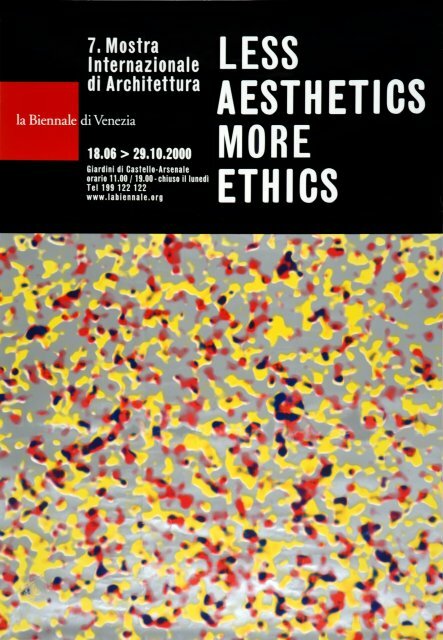 The Artiglierie dell’Arsenale hosted Uneternal City. Trent’anni da “Roma interrotta”, twelve different project visions on Rome and its suburbs. The Artiglierie hosted the top 10 selected works, and the 40 special mentions for the online student contest EveryVille 2008. Comunità oltre il Luogo. Senso civico oltre l’Architettura. At the Padiglione Italia a retrospective on experimental architecture was set up, titled Experimental Architecture, made up of different monographic exhibitions of those studios that based their research on experimentation: Frank Gehry, Herzog & de Meuron, Morphosis, Zaha Hadid, Rem Koolhaas and Coop Himmelb(l)au. Special Golden Lion for lifetime achievement to a historian of Architecture: James S. Ackerman. Golden Lion for Best National Participant: Poland (“Hotel Polonia. The afterlife of buildings”). A project by Nicolas Grospierre and Kobas Laksa. Site:Arsenale, Giardini. Collateral section in Palermo. Centered on Cities. Architecture and society the 10th edition is focused on the so-called “global cities” themes, cities where more than three or four million people permanently live, facing various types of problems: from immigration to growth hardships, from the evolution of mobility to sustainable development research.The Exhibition takes into account some crucial questions of contemporary society, trying to delve into the possible interactions between architecture and its real users. More specifically, much attention was paid to the role of architects when it comes to designing democratic and sustainable urban landscapes, as well as their links to policies of intervention, government statements and social cohesion. The exhibition took place at the Corderie dell’Arsenale, through screenings of never before seen films on mega screens, tridimensionally elaborated graphs – a set up of 16 big cities and their urban experiences, in four different continents: Mumbai and Tokyo in Asia; Caracas, Mexico City, Bogotá, São Paulo, Los Angeles and New York in America; Johannesburg, Cairo and Istanbul in Africa and in the Mediterranean area; European cities such as London, Barcelona, Berlin and Milan-Turin. In the Padiglione Italia at the Giardini, this complex vision of urban transformation was analyzed by 12 different International research centers. 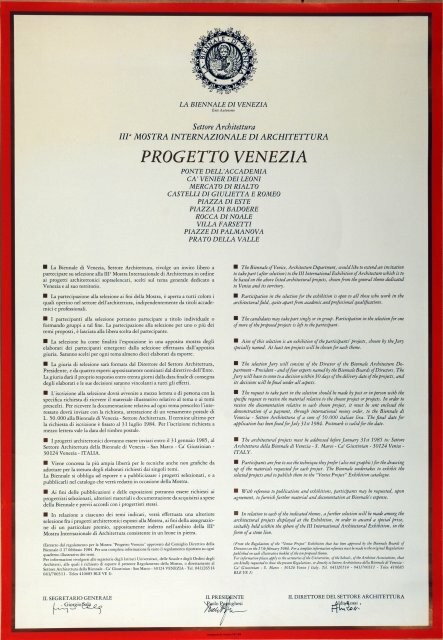 By taking the daily life of the world’s metropolises to Venice, by inviting international research centers to share their activities with visitors, the 10th edition of the Exhibition showed a manifesto for the 21st century city, devoted to the potential contribution of megalopolises for a better, more democratic and fair world. The 10th Architecture Biennale also presented how collateral sections of projects focused on Southern Italy, which accompanied the International exhibition: Città di Pietra curated by Claudio D'Amato Guerrieri, set up in Venice at the Artiglierie dell'Arsenale and Città - Porto, curated by Rinio Bruttomesso, set up in Palermo in three different venues. Golden Lion for Best Urban Projects: Javier Sanchez/Higuera + Sanchez for the housing development project “Brazil 44” in Mexico City. Nowadays the use of computers during design phases, and the increasing availability of avant-garde materials, allow the creation of original, dauntless constructions. 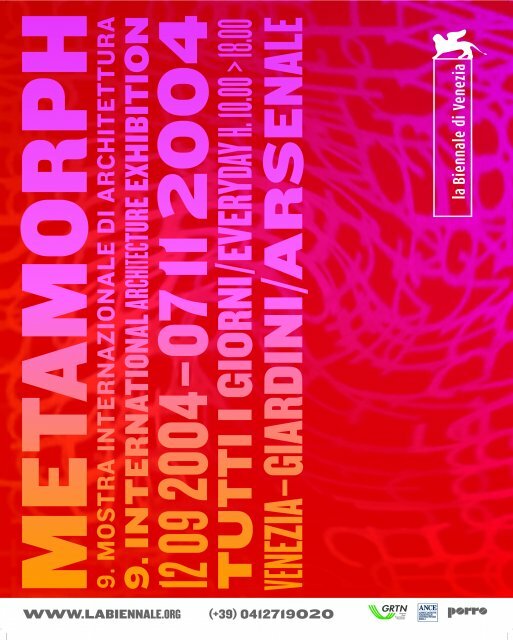 The metamorphosisin architecture, dictated and facilitated by new technologies and materials, was therefore the theme chosen by Director Kurt W. Forster for the ninth edition of the Architecture Biennale. Forster proposed his vision of contemporary architecture as a movement where untold meetings and new relations can happen, challenging the traditional idea of architecture as a union of isolated, well-defined elements. The sinuous lines featured in the set up of Asympote studio at the Corderie dell’Arsenale effectively represented the metamorphosis theme picked up by Forster. Using computer technology, the Asymptote created modular structures that teared the central perspective of the Corderie, letting each section spontaneously and simultaneously slide into the next one, as in a growing metamorphosis process. The Arsenale exhibition was divided into seven sections, each centered on a specific theme: Transformations, Topography, Surface, Atmosphere, Hyper-Project, Harrowing of the City, The Nature of Artifice. The first and most significant section, Transformations, was devoted to four artists that profoundly changed the theoretical debate at the beginning of the 80’s: Aldo Rossi and James Stirling on one side, Eisenman and Gehry on the other. In particular, the second couple of architects is considered a pioneering team when it comes to anticipating many solutions which have become paradigmatic in the last years. In the spaces of the Padiglione Italia, photographers and architects were invited to develop, through site-specific interventions and installation, the concept of metamorphosis, as well as its relation to space and architecture. The visitor could feel like personally experiencing the evolutions and the changes of the real world. Moreover, three different monographic exhibitions were set up, centered on two great masters of the past, Gladio Dieste and Ivan Leonidov, and on a contemporary one, Peter Eisenman. 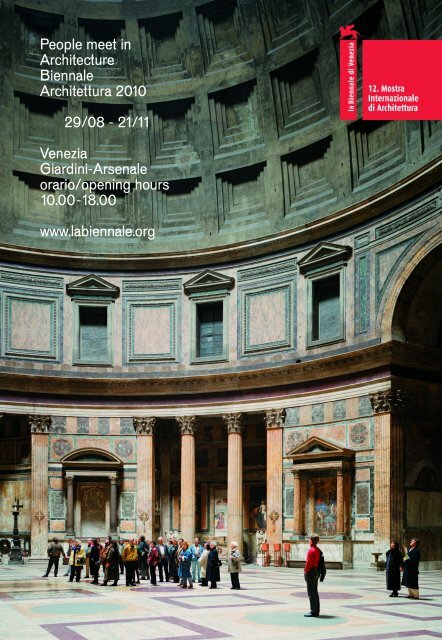 The Italian section, curated by DARC, presented the shots of ten Italian photographers who cooperated with other architecture historians and critics on a research about the last 50 years of architecture in Italy. What will architecture be like in the future? 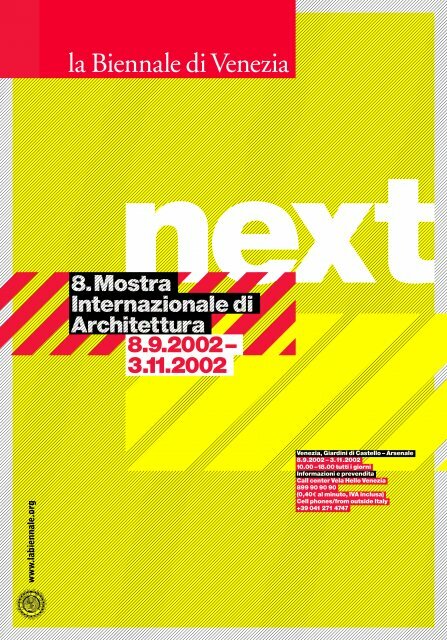 This is the question the 8th International Architecture Exhibition, directed by Deyan Sudjic and titled Next, tried to answer. The temporal displacement between ideation/designing of a building, and its effective realization, often makes the result look a little obsolete. Sudjic is sure that today, thanks to sketches, models and new technologies, it is possible for us to foresee the architecture of the nearest future, with a limited margin of error. The exhibitions therefore aimed at creating in architects’ studios, in their physical models and in the analyzed materials, the traces and the elements for future projects. At the same time, it is also possible to select the geographical areas that will host the most innovative projects in the future, even though there is nothing significant yet: Sudjic imagined a possible future scenario for China, where the most interesting creations could be realized. One of the key features of this Architecture Biennale is the attention paid to the materials: all the designers involved were invited to display not only drawings and plastic models, but also concrete materials such as bricks, glass, metal, in order to physically prove the impact they can have on architectural space. Through its different sections, Next was intended to suggest an enquiry on the most widespread constructive types: Housing, Museums, Communication, Education, Towers, Work, Shopping, Performance, Church and State, Masterplans, Italy. To such section, where designs from the world’s major architects were displayed, an exhibition called City of Towers, is added, an independent section realized in collaboration with Alessi: some of today’s most renowned architects were asked to present the 1:100 model of a skyscraper. One year after the Twin Towers bombing in New York, this exhibition highlighted a new interest for vertical expansion and for skyscrapers, which ultimately can reaffirm the modernity of nowadays cities. The London Swiss RA headquarters by Norman Foster and the Torre Agbar in Barcelona by Jean Nouvel, both exhibited, are just some recent significant examples of skyscraper design. At the Giardini, the Italian section at the Padiglione Italia was centered on a series of projects, some of which realized by foreign architects too, aiming at requalifying some Italian areas, such as the intervention on the San Michele cemetery in Venice by David Chipperfield. The USA Pavilion hosted a selection of shoots of September 11th, as well as suggestions for the restoration and the reconstruction of Ground Zero. With a Biennale centered on research, titled Less Aesthetics, More Ethics, Massimiliano Fuksas abandons the usual set up of the previous Biennali. The exhibition is no longer based on the idea of architecture as buildings, but develops a 360° perspective on contemporary city, especially the megalopolis of the 21st century. As the title itself points out, it is essential for Fuksas to find a new way to relate to architecture, favoring the research of new ethical responses, rather than simply aesthetics, when developing a project. From the 90’s onward, the largeness and the speed in urban transformations, especially in Latin America, Asian South-East and Africa, have determined, along with pollution and a huge development of dimensions, new social discontent and disparity. This is why Fuksas decided to “use the Biennale as a lab to analyze the new planetary dimension of urban behaviors and transformations”, highlighting three main themes: the Environment, both as an object and a subject for thinking; Society, which represents the attention to urban changes; Technology, as information, communication, virtual dimensions. The Corderie, the Artiglierie, the empty spaces at the Arsenale up to the Vergini (recovered by the Biennale presided by Paolo Baratta in 1999, and used for Architecture for the first time) and the Padiglione Italia, hosted a selection of architects, artists and photographers that had investigated metropolitan changes in the last years. More specifically, the set up at the Corderie dell’Arsenale, revising the continuous perspective of the Strada Novissima in 1980, is a significant example of fusion between digital technology and the architectural debate. In the 300 meters of the Corderie, a mega screen would present twelve videos of contemporary megalopolis: Bogotà, Buenos Aires, Bucharest, Budapest, Mexico City, New Delhi, Paris, São Paulo, Quito, Cairo, Athens and Montréal. The megalopolis appears to be a sort of global magma, where cultural stereotypes, turistic and economic flows all live together along with urban decay situations, which are often ignored or understated. The spaces of the Padiglione Italia hosted the works of architects, artists and photographers that, through different practices and methods, have questioned the evolution of the metropolis, underlining the necessity o fan interdisciplinary approach to catch up with the challenges present times may hold. Golden Lion for Lifetime Achievement: Renzo Piano, Paolo Soleri and Jørn Utzon. The sixth Architecture Biennale is committed to the direction of a prestigious international personality, Austrian architect Hans Hollein, who confirms Dal Co’s setting-out, modeling the exhibition to the standards of the Visual Arts one, and hosting national participations. Sensori del futuro. L’architetto come sismografo is the title of the main exhibition hosted at the Padiglione Italia, and its aim is to investigate the architect’s ability to catch underground vibes of present times, translating them in the future. Hollein thinks it is not appropriate for architects to be part of specific movements or schools of thought in the 90’s; otherwise, they should be self-sufficient professional figures, not dependent from classifications. Thanks to the attention paid to these unusual elements, such as communication systems and new technologies, architects can change key places in urban landscapes, challenging the traditional idea of urban space inherited from traditions. Approximately seventy architects were invited to exhibit a significant project, to be a sort of personal testament. This is why, on this edition, the rooms of the Padiglione Italia were filled with the works of the major international architects, such as Frank O. Gehry (with his designs for the Guggenheim Museum in Bilbao), Tadao Ando, Jean Nouvel, Renzo Piano, Zaha Hadid, Coop Himmelb(l)au, Peter Eisenman, Norman Foster, Herzog & de Meuron, Arata Isozaki, Toyo Ito, Philippe Stark, Jorn Utzon, Alvaro Siza Vieira, Massimiliano Fuksas, Rem Koolhaas, Rafael Moneo. Along with globally renowned architects, Hollein also organized the Emerging Voices exhibition, where young promising talents were gathered from all over the world, such as Odile Decq, Liz Diller with Ricardo Scofidio, Peter Zumthor, Ben van Berkel, Kazuyo Sejima. The Padiglione Italia also hosted the Radicals retrospective, centered in the most radical experiences of urban architecture from the end of the 50’s until the beginning of the 70’s. The Italian section, curated by Marino Folin and set up at the Padiglione Italia with big scale projects and facades, was devoted to young architects between 30 and 40 years of age, displaying works that had to be no more than 5 years old. A photographic exhibition, realized thanks to the joint collaboration between photographer Gabriele Basilico and architect Stefano Boeri and dedicated to the Italian landscape – both urban and natural-, was hosted there as well. In 1996, the Golden Lion was instituted for the Architecture Biennale; and three great masters of the 20th century, Ignazio Gardella, Philip Johnson and Oscar Niemeyer were awarded the prize. Francesco Dal Co is appointed director of the Architecture Section in 1988 by the Administration Board presided by Paolo Portoghesi, in his second four-year mandate. 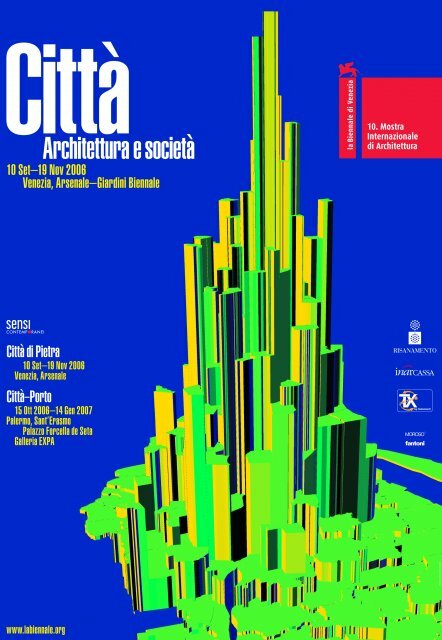 The fifth International Architecture Exhibition takes place in 1991, resuming in its different sections the work and the activities promoted by Dal Co in the previous years. A staunch proponent of the necessity of developing the Biennale’s internationality, Dal Co introduces various novelties, modeling this edition to the style of the Art Exhibition, and inviting National Pavilions to participate in this. Among the most important suggestions present is the Austrian selection –showing works by Coop Himmelb(l)au, United States with Peter Eisenman and Frank O. Gehry, Switzerland with a Herzog & de Meuron retrospect and Norway with Sverre Fehn. In the Padiglione Italia, Dal Co shows a selection of forty Italian architects for the 90’s, among whom we can find Gae Aulenti, Massimiliano Fuksas, Aldo Aymonino, Giancarlo De Carlo, Renzo Piano, Luciano Semerani and Ettore Sottsass. Two other events mark the importance of the fifth Biennale: the building of the the Book Pavilion, designed by James Stirling, in the main entrance street to the Giardini, and the exhibition of 43 architecture schools from all over the world at the Corderie dell’Arsenale. 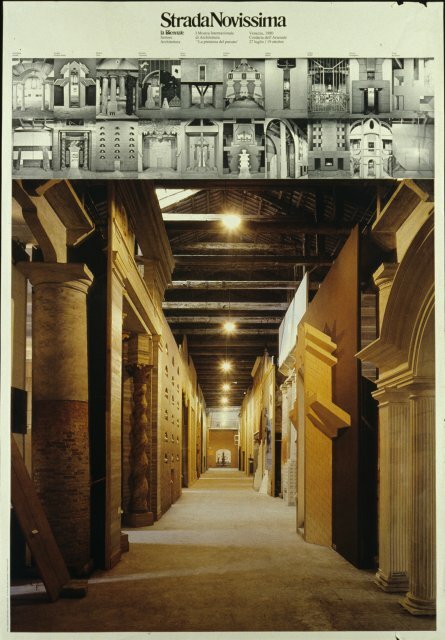 In this 5th Architecture Exhibition, Dal Co also stresses the importance of a confrontation between the Biennale and the Venetian territory, as the three different contest proclaimed under his direction from 1988 on testify; the themes on which they were centered were the restoration of the Padiglione Italia (contest won by Francesco Cellini), the restoration of the Palazzo del Cinema at the Lido (won by Rafael Moneo) and the requalification of Piazzale Roma. In spite of the Biennale’s good omens, none of the winning project was ever realized, unlike Stirling’s Bokk Pavilion, which is still considered one of the most successful and long lasting results of that edition. The Aliante installation by Massimo Scolari, allocated on the Fondamenta della Tana at the time, as an external sign for the schools of architecture exhibition, will be long-lived, as it is still displayed outside the IUAV buildings in Santa Marta, Venice. The fourth Architecture Biennale is organized one year after the previous one (it breaks the two-year deadline once again) and is dedicated to the work of a single architect, Hendrik Petrus Berlage (Amsterdam, 1865-1934). Director Aldo Rossi collects, for the first time in Europe, the corpus of all the designs of this Dutch master and organizes their display at Villa Farsetti in Santa Maria di Sala, on the Venetian mainland, underlining his will to make the Biennale institution interact with local territories. Villa Farsetti, moreover, is the perfect response to the need of finding an alternative space for the exhibitions, given that the International Art Exhibition was opening in the same period. Berlage’s imperative is “Look at the building and at its history”. The constant attention he shows for History is one of the main reasons for the Biennale to devote its interest to him. Keeping faithful to its criticism towards the Modernist movement and its rationalism, this edition, as the previous ones, is centered in the relationship that, according to Portoghesi and Rossi, contemporary architecture should keep with the past. 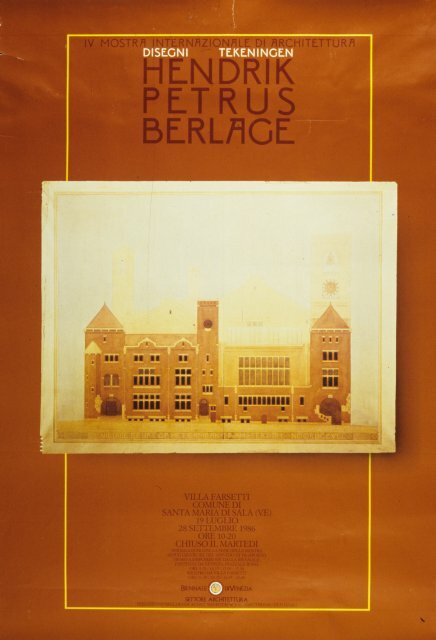 Suspicious of liberty’s wiggly lines, and detached from the avant-gardes and the glorification of progress, Berlage develops an independent thought which leads him to design some of the most important architectural projects of the 20th century, such as the Stock Exchange in Amsterdam in 1903. A series of utopic compositions testify the fascination that creating a “total work of art” hold on him, unifying art, architecture, history and space: Beethoven’s house, Wagner Theatre on behalf of the Wagner Society, the Lenin mausoleum in the Red Square are typical examples of such a will. Right after Venice, the exhibition moved to Amsterdam, Paris and Berlin, in order to make people know the actuality and the force of this master’s admirable work. 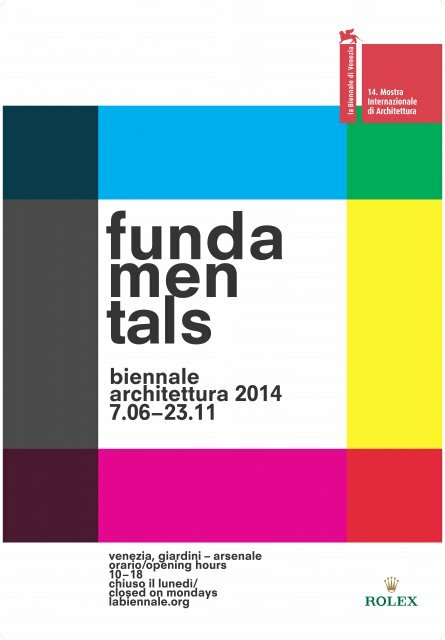 The third edition of the Architecture Biennale takes place three years after the second one, and is directed by Aldo Rossi (Portoghesi became President of the Biennale in the meantime). Its title, Progetto Venezia, resumes the two key concepts of the exhibition: the priority given to the moment of planning and the comparison with the Venetian landscape. Aldo Rossi invites affirmed architects, but also young and less famous ones, to display their ideas and designs for the requalification or the transformation of specific areas of the lagoon town and its mainland. An international jury is appointed, with the aim of selecting the best projects. In a city known for its antimodern character, where it is extremely difficult to create new architectural spaces, the challenge and the opportunity to reinvent urban sites given by Progetto Venezia is praised by many. Approximately 1500 participants from all over the world apply for the selection. The theme is extended to other areas of Veneto and Friuli as well as Venice itself. Peter Eisenman’s suggestion, that is to re-elaborate the history and the legend of Romeo and Juliet, and Libeskind’s intervention designs for Palmanova, are among the most interesting examples this Biennale offered. The theme that got much of the interest from participating architects is the invitation to re-design the Accademia Bridge on the Grand Canal. The possible suggestions go from those that are still anchored to Venetian artistic roots, such as the Venturi/Rauch/Scott-Brown’s one, to those creating innovative architectural movements, such as those of Franco Purini and Costantino Dardi. The diversity of points of view collected at the Padiglione Italia at the Giardini, the significant participation among young people and all the energies mobilized by the third Architecture Biennale, testify the high profile quality level reached by is exhibitions. In the second Biennale di Architettura, Portoghesi proposes an overview on the Architecture in Islamic countries, from the aftermath of 2nd World War onward. Venice becomes an observation post from which to look at the architecture of those regions between India and Morocco, becoming once again a privileged crossroads and a gathering point between Western and Eastern countries, and foreseeing a burning issue for the years to come. In the introduction to the catalogue, Portoghesi underlines how the influence of the Islamic culture has become stronger since the end of the 19th century, especially in western literature, arts and architecture, influencing personalities such as Gaudì, Wright and Le Corbusier. The attention for environmental contexts, the spiritual component and the basic social purpose of Islamic architecture is opposed to the coldness and self-referential elements of modernist standards. The exhibition presents a series of projects, both in the pipeline and fully realized, in which local traditions are combined with the most innovative construction technologies. Particular importance is paid to the works of Hassan Fahty, a prominent figure among Egyptian young designers. Moreover, other monographic exhibitions were curated, all centered on other leading personalities who confronted with Islamic architecture, such as Fernand Pouillon and Louis Kahn, with a series of drawings destined to urban centers in India and Pakistan, and two projects by Le Corbusier for the city of Algeri and Chandigarth. In parallel, the second edition of the Architecture Biennale shows a series of restoring and requalification suggestions for ancient housing estates. The leitmotiv of the 1st International Architecture Exhibition, directed by Paolo Portoghesi and titled La presenza del passato, is a consideration of the so-called Postmodernist movement. This school of thought questions the Modern, with its almost mythical consideration of future, technology and geometric forms. Since present times do not seem able to offer anything new from the past, Postmodernism suggests a new synchronic vision of History, that ultimately becomes an infinite warehouse for images and suggestions, from which architects can freely draw shapes, styles and decorative elements. This is the idea on which Portoghesi created his Strada Novissima, the main exhibition set up at the Corderie dell’Arsenale, a striking space opened for the first time thanks to the Biennale. Strada Novissima was made up of twenty façades, designed by an equal number of great architects, and conceived as theatre wings for a hypothetical postmodern “street”. The exhibition offered visitors a direct and tactile experience of architecture: an exhibit, as Portoghesi underlined, “with architecture, not about architecture”. For the realisation of Strada Novissima, which opened a very lively debate on Postmodernism, becoming a symbol of the movement itself, big names were collected, among which we can find Frank O. Gehry, Rem Koolhaas, Arata Isozaki, Robert Venturi, Franco Purini, Ricardo Bofil, Christian de Portzamparc. Beyond each façade, every architect presented a monographic display of their works. Thanks to this exhibition, the Biennale became an influential protagonist within international architectural debates since the very beginning, thanks to its ability to draw the most renowned and high profile tendencies to Venice. The Postmodernist movement asserted itself as a leading, internationally known approach, thanks to Strada Novissima and to the previous episode of Aldo Rossi’s Teatro del Mondo (an ephemeral building anchored to the Punta della Dogana between 1979 and 1980). 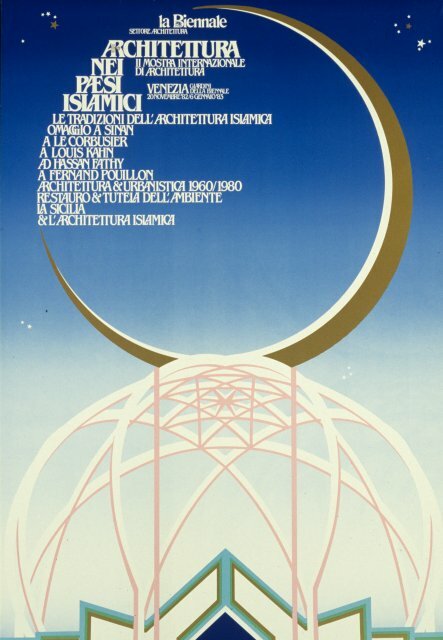 La presenza del passato also included three 20th century masters, Philip Johnson, Ignazio Gardella and Mario Ridolfi, who had the courage to follow alternative paths that differed from modernist dictates, a special section devoted to 73 young architects and a retrospect on Ernesto Basile. 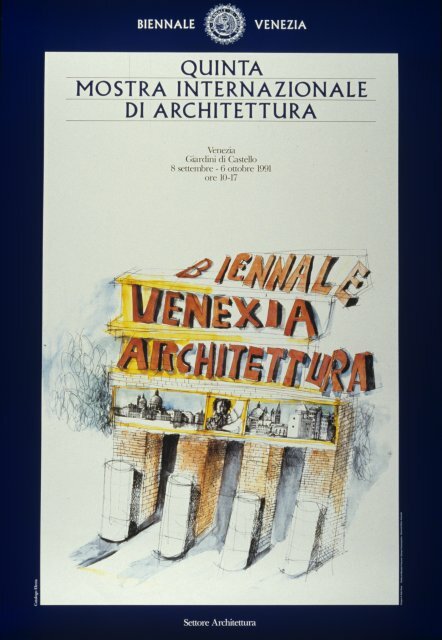 In 1975, the first steps towards an architecture exhibition were taken by La Biennale di Venezia, an enlargement so significant that it entailed the appointment of a new director for the Visual Arts section, Vittorio Gregotti, during the four-year presidency of Carlo Ripa di Meana (1975-1978). It was in fact within the Visual Arts exhibition that the A proposito del Mulino Stucky exhibit at the Magazzini del Sale was organized by Vittorio Gregotti, followed by other architecture exhibitions in 1976 and 1978. In 1980, the Architecture department finally became independent during the four-year presidency of Giuseppe Galasso (1979-1982), who appointed Paolo Portoghesi as director. After the Teatro del Mondo realized by Aldo Rossi (1979-1980), the new director organized in 1980 the 1st International Architecture Exhibition titled La presenza del passato.